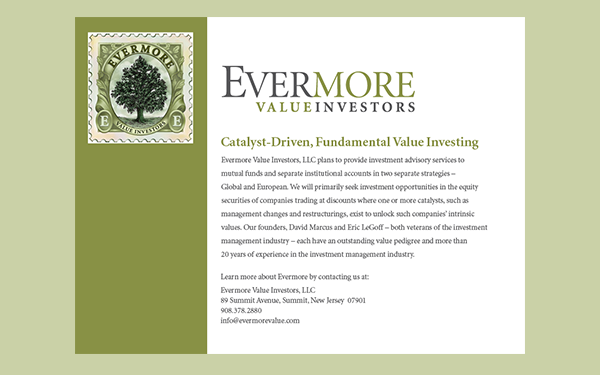 Evermore Value Investors was a new mutual fund investment firm that needed branding. The client wanted to emphasize that the investment advisors at the company had many years of investing expertise. The stamp gives the investor the feeling of experienced money management, because it has the feel not only of a stamp but also of a dollar bill. The tree symbolizes steadiness and strength. The name reveals the benefits of value investing, and the type treatment is very traditional. We hired an illustrator to actualize the idea. The logo was used on stationery, business cards, a splash page for the website and a pitchbook for the company. 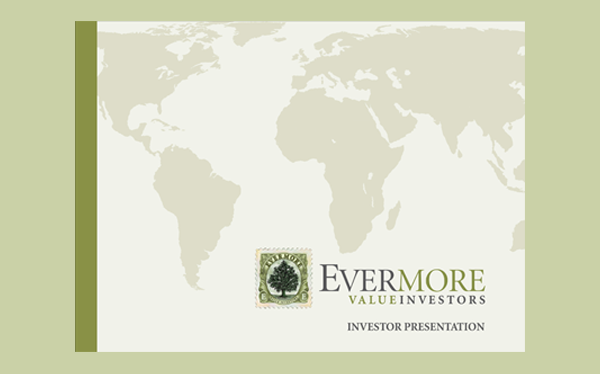 Eventually the client decided to change the name to Evermore Global Advisors as they wanted a more comprehensive name. They kept the same look with the name change.